The name ‘Pishon’ is not French, as many would assume with a glance at its phonetics, but Hebrew and it means ‘grace’ or ‘peacefulness’. It is also the name of one of the rivers in the Garden of Eden, winding through the ‘entire land of Havilah where there is gold’ (Genesis 2:11). If there’s ever a time to believe in the prophetic properties in a name, this is one such instance. In its patisserie form, Pishon at 8AM is a bubble of gentle quietness, flooded with natural light and sleepily blinking awake. 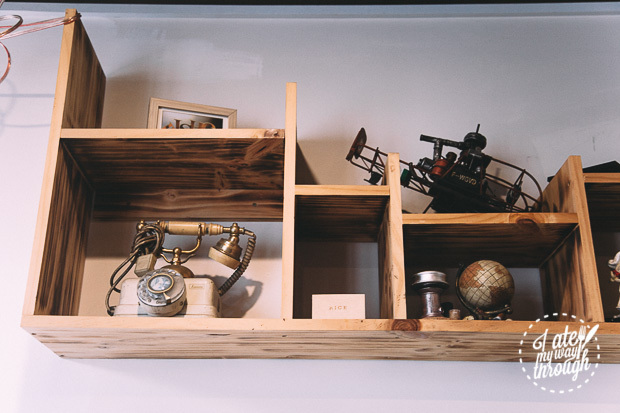 The space gives the impression of a European dollhouse, as interpreted by South Korean or Japanese interior designers: equal parts homely, cheerful and cute, decorated as you might expect from a store that boasts something very close to a white picket fence out front. 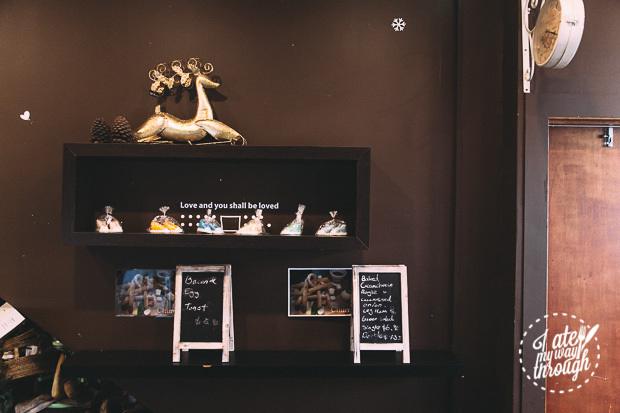 The café is replete with comfortably bright, wood-accented features and eclectic, slightly retro decorations on display on the walls that are mostly sourced from South Korea and Japan. Seven-month-old Christmas decorations are included (we’ve all been there). Joon Tae Lim, owner and patissier of Pishon, greets us with warmth and hospitality that is admirable from someone who runs a 24 hour kitchen and who had been up since 4AM. 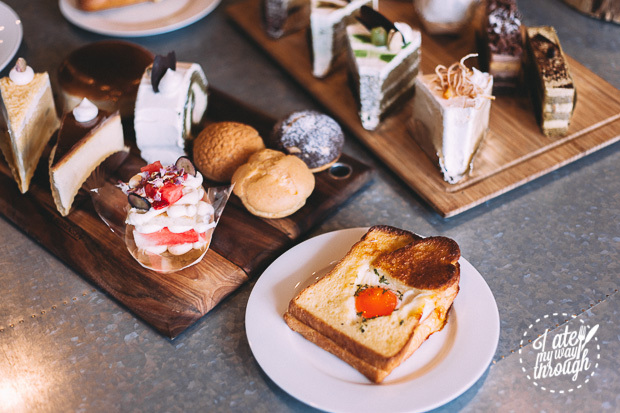 We are led upstairs to the second floor, which is even more tranquil than below, and treated to a veritable feast of Pishon’s ‘gold’: drinks, pastries, desserts and breads, all served on cute wooden blocks. 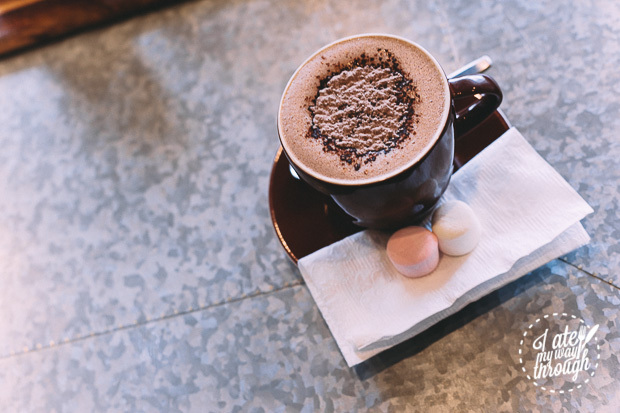 I began with Pishon’s popular hot chocolate ($5.50 Dine In), which was foam-covered and richly flavoured with Ghana-sourced chocolate, but not thick enough to be too overwhelming. My dining companion went with the green tea, which would probably have been a good idea, given the huge dessert journey we were about to embark on. 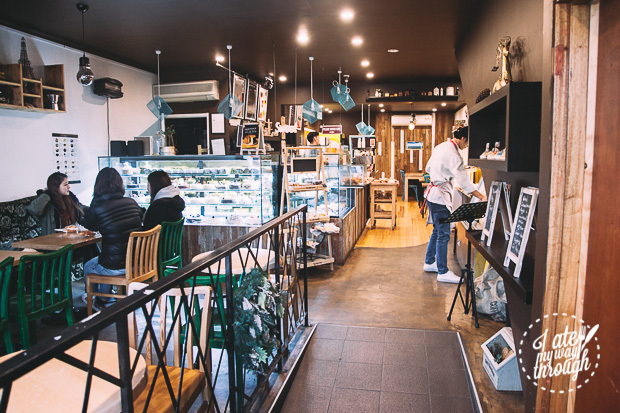 Trained in South Korean, French, Japanese baking techniques, Joon offers food that is internationally diverse, but with Asian influences as the underlying theme. 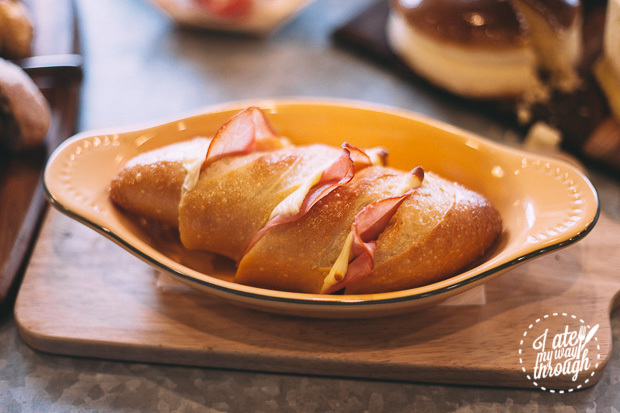 Both the savoury Egg Ham Toast ($3) and Ham and Cheese Baguette ($4.50) incorporated East Asian style sweetness by drizzling a sweet glaze or sauce over the bread, which can be slightly unusual to Western palates. That being said, the cheese and ham complemented the fluffy baguette well and I loved the runny egg baked into the toast. The Scones with Jam and Cream ($2) are also sweet-corn based, which gives them a beautiful yellow colour, a nicely crunchy crust and slightly lighter texture – though, again, it’s perhaps inherently sweeter than traditional, Western-style scones. The Wholemeal Light Bread ($4) with olive oil balsamic vinaigrette and blue cheese dip is a new addition to Pishon’s menu and great for those who want no sugar in their breakfast. 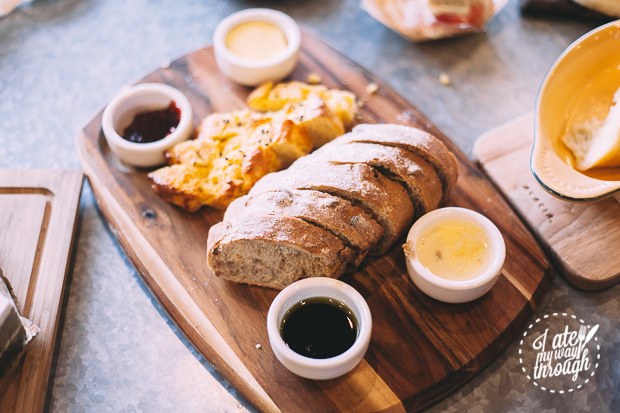 The bread was soft, fluffy and had a thin, crispy crust to it, perfect for soaking in the flavours of the dips. 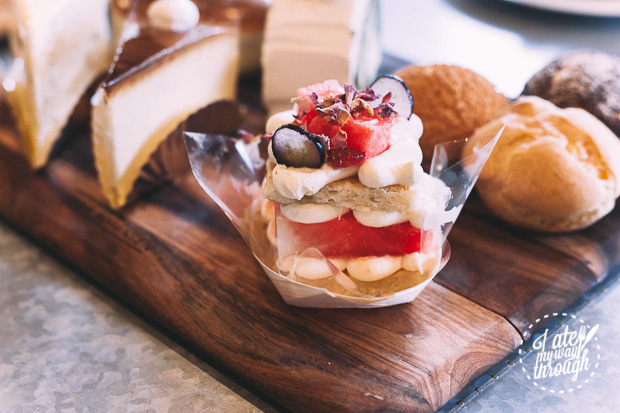 The Mini Cake-Rose Watermelon slice ($7) caused a slight double-take, which is understandable as Joon created it at the request of customers who wanted the Pishon version of Black Star Pastry’s iconic dessert. Though it lacks the textural complexity of Black Star’s layers, the delicate, refreshing combination of vivid rose cream and watermelon preserves the core essence of the flavours and makes for a great alternative to a trek out to the city for the real deal. 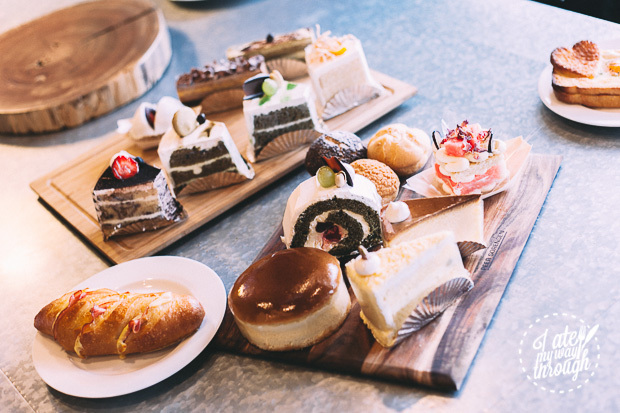 ‘Light and natural’ is the theme to most of Pishon’s beautifully decorated, very photogenic desserts. You could call the airy, loose sponges a little insubstantial but it also allows you to avoid feeling too weighed down by your dessert indulgences. Asian-style cakes tend to use copious amounts of whipped cream, which I usually can’t stand, but Pishon managed to balance the portions so it didn’t overwhelm the chiffon cakes. My personal favourite was the Orange Chiffon Cake ($6.80), which boasted a beautifully flavoured and moist sponge, though I wish the candied orange peel had been replaced by something sour to balance the sugar. The Sweet Potato Cake ($5) is one of Pishon’s more distinctive Asian-inspired desserts and does a good job at incorporating the subtle sweetness of the potato into the cream and sponge. I was not as fond of the cream-to-sponge ratio of the Green Tea Roll Cake ($6.80) (read: a lot of cream). 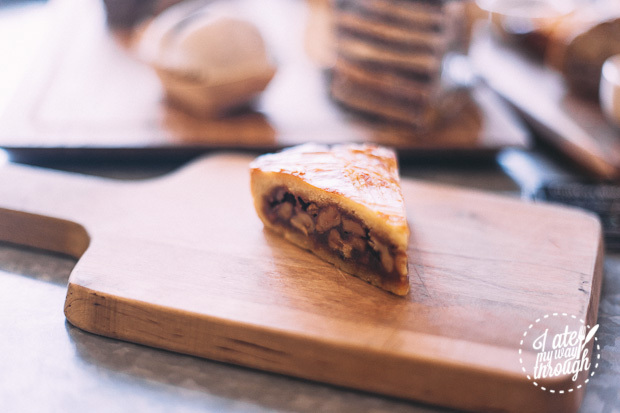 For those wanting something a little more substantial, the Sliced Engadiner ($4) is a definite recommendation; the flaky German-style pastry is generously loaded with fragrant caramelised walnuts that balances the sweetness of the caramel perfectly. 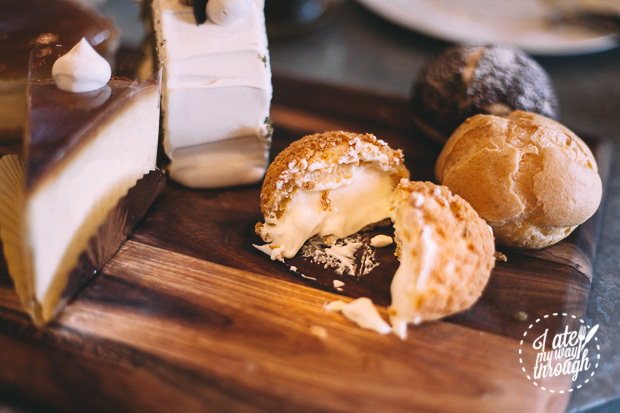 The Cream Cheese Profiterole ($1.20) is also a must-have, as the slightly crumbly casing goes perfectly with the runnier cream cheese filling, which added more complexity to the sweetness. 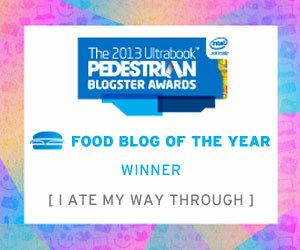 I also loved the yoghurt, red bean and cream filling of the Chocolate Profiterole ($1.20). The smooth Baby Profiterole ($1.20) was the most classic one with a custard filling, but still a solid choice. 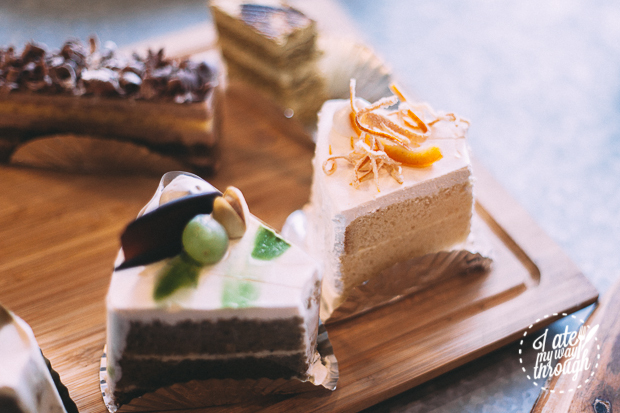 The Japanese-style Trio-Coloured Gateau ($4.50) is great for livening up the Instagram feed and for those who want a simple kick of vivid coffee or chocolate flavour that permeates through the layers (personally, I prefer the coffee). I did find myself wishing for a slightly more solid base than more sponge cake, which would elevate the dessert, texturally. The texture of the round Yoghurt Cheesecake ($8) reminds me more of a dense, cheesecake-flavoured sponge cake than actual cheesecake and lacked a solid base. The Sliced Cheese Cake ($4.50) is based on a soufflé, and even airier. 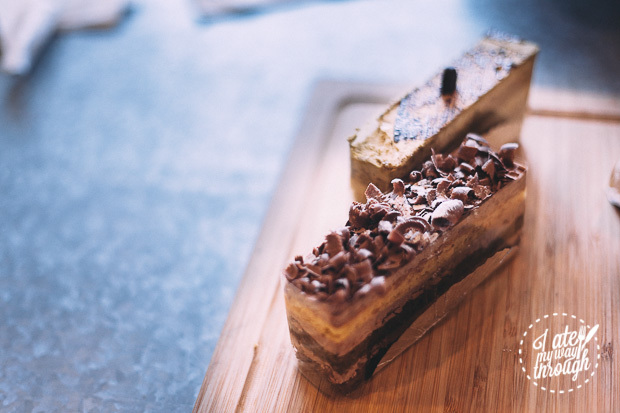 I’m not a huge fan of Asian-style cheesecake, mostly because the density and solid pastries of Western-style cheesecakes is exactly why I love them but these could be good alternatives if you don’t want to commit to the heaviness of ‘traditional’ cheesecake. 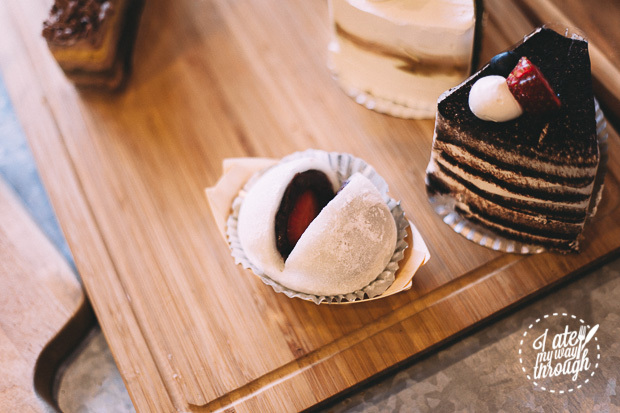 The Strawberry Mochi ($7.80) is 100% home-made, from the mochi to red bean filling (made twice a week), which means the mochi boasts the right texture of being sticky but not plastic-y. The fresh strawberry inside adds a great burst of tangy flavour that cut through the density of the red bean paste. To say we were very full by the end is a gigantic understatement. 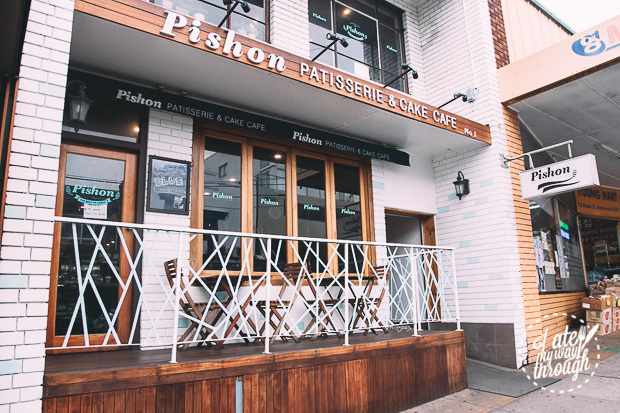 It has not been an easy journey for Pishon, which is now in its sixth year of running, with branches in Chatswood, Hornsby (note the Hornsby branch is only open on weekdays). Joon tells us of running on a grand total of 1.5 hours of sleep during Pishon’s first week of operations and several falls in the kitchen, due to the frenzy of keeping up with orders. Once, Pishon had to prepare 3 wedding cakes and 21 ‘special cakes’ in a day. It’s that same dedication to detail and care that that drives Joon travel to Vanuatu to find coffee bean suppliers and help those in need as part of his work for Agape International Missions. 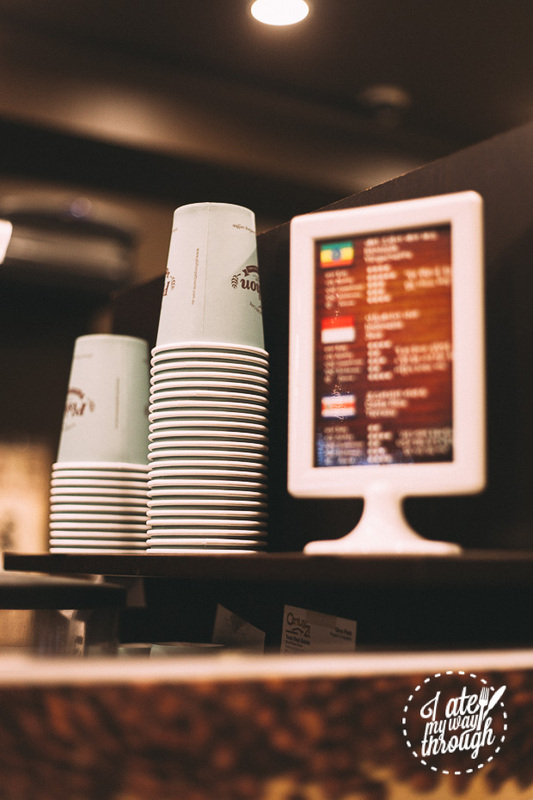 Pishon is certainly not a fast-moving whirlwind shouted orders, coffee machine grinding and the in-and-out clientele that are necessarily characteristics of some of the more popular café haunts in Sydney’s busier regions. 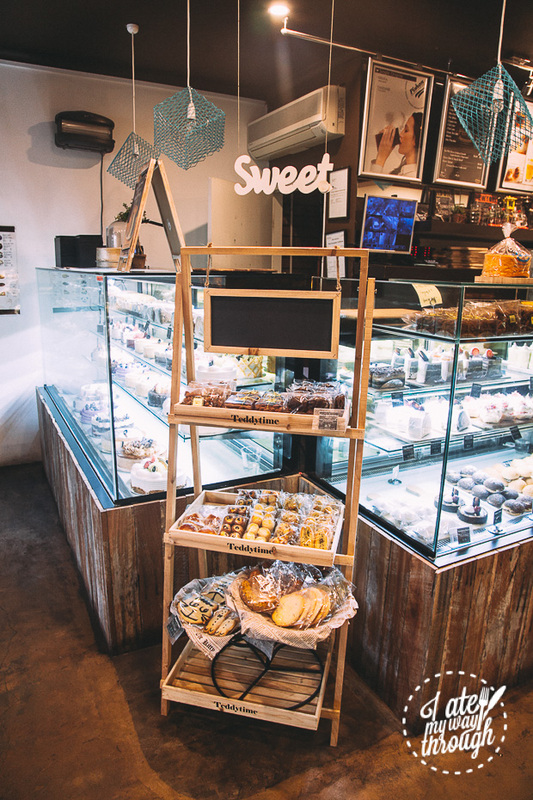 It is, however, a place of simple hospitality: one that invites you to take a seat, relax and take a second for sweetness, whether that’s at breakfast, lunch or dinner. 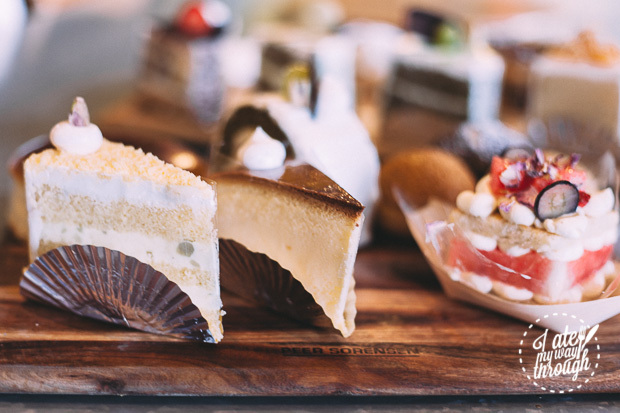 Life is too short, after all: eat dessert first. Christina delights in new experiences and aims to create content that inspires, whether that's with her words, camera or paintbrush. If she's not working her way through an entire trees’ worth of readings from her combined Media and Law degree, she’s probably planning her next travel adventure, taking shots of everything she experiences (and eats) and blogging it all at sketchandrun.com. Feed her tapioca pearls in Asian bubble tea and she’ll love you forever.